Context: People living in rural and remote areas have been found to suffer higher rates of mental illness and psychological distress than their urban counterparts. However, rural and remote Australians also suffer from a lack of specialist mental health services. Mental health consumers are concerned about the lack of access to specialist mental health care and report poor service quality and stigmatizing staff attitudes when presenting with mental health emergencies at acute care facilities. Standards for the Mental Health Workforce released in 2002 promote respect for the individual, their family and carers; best practice in the assessment, early detection and management of acute illness; promotion of mental health and safety; and the prevention of relapse. These standards are for generalists providing care to mentally ill patients; their family and carers in the acute care setting; as well as specialist mental health professionals. 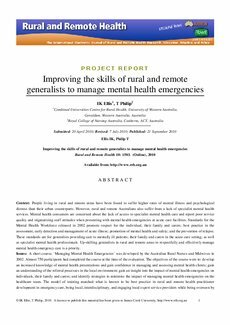 Up-skilling generalists in rural and remote areas to respectfully and effectively manage mental health emergency care is a priority. Issues: A short course, 'Managing Mental Health Emergencies' was developed by the Australian Rural Nurses and Midwives in 2002. Almost 750 participants had completed the course at the time of the evaluation. The objectives of the course were to: develop an increased knowledge of mental health presentations and gain confidence in managing and assessing mental health clients; gain an understanding of the referral processes in the local environment; gain an insight into the impact of mental health emergencies on individuals, their family and carers; and identify strategies to minimise the impact of managing mental health emergencies on the healthcare team. The model of training matched what is known to be best practice in rural and remote health practitioner development in emergency care, being local, interdisciplinary, and engaging local expert service providers while being overseen by a national steering committee. The evaluation consisted of a pre- (n=456) and post-course (n=163) survey, and follow-up interviews with participants between 3 and 6 months post-course (n=44). Lessons learned: The pre- and post-survey identified that, as a result of the course, participants had improved confidence in seeking information about suicide ideation, were significantly more able to differentiate between substance intoxication and psychosis (χ2[df=1, n=619] =140.9, p<.000); and between dementia and delirium (χ2[df=3, n=619] =126.5, p<.000). The follow-up interview notes were analysed using thematic analysis. Three themes were used: changing attitudes; changing clinical practice; and communication. Participants had reflected on their attitudes following the course and recognized how these had been stigmatizing. Many participants reported putting their new skills into practice and reported better recognition of non-verbal cues and better information seeking from family members, past history and police. The Managing Mental Health Emergencies course is a valuable addition to the emergency courses available to rural and remote healthcare providers.